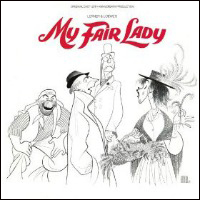 Original London Cast, 1959 (Columbia/Sony) (2 / 5) The peerless original Broadway cast album of My Fair Lady was recorded just a few months before stereo was established as the industry norm. Since the four leads of the Broadway production repeated their roles in London, the powers that were at Columbia Records decided that a new cast album in true stereo would be highly marketable. Alas, the London recording turned out to be something of a dud. Harrison over-inflects much of the role, as if he were bored with it. Andrews sounds rather tired and droopy — although, on the plus side, her Cockney accent seems more organic than on the prior album, which helps make for a more satisfying performance of “Wouldn’t It be Loverly?” This time out, both Andrews and Holloway indulge in talk-singing rather too often. Coote rushes “You Did It,” which is surprising, since conductor Cyril Ornadel’s conducting of this and some of the other numbers is brisk to begin with. In Freddy’s “On the Street Where You Live,” Leonard Weir sounds a little under-powered on the lower notes, even though the key of the song has been raised; but his voice really blooms on the high notes, and his accent is more authentically British than his Broadway predecessor. Ironically, the sound quality of this recording is inferior to that of the original. Yes, the London album is stereophonic, but there’s significant distortion in certain tracks (most severely in the overture), and the general timbre of the sound is less warm than the monophonic original. — M.P. 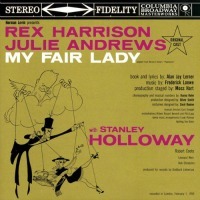 Film Soundtrack, 1964 (Columbia/Sony) (3 / 5) This recording boasts fabulous orchestrations by Alexander Courage, Robert Franklyn, and Al Woodbury, created under the supervision of conductor André Previn. The orchestrations are lush without ever seeming gimmicky or overblown. 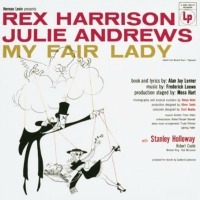 Rex Harrison’s Henry Higgins actually sounds fresher here than on the London cast recording; it would seem that a break from the role benefited his performance. 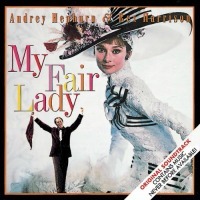 As for Eliza Doolittle, the initial plan was to try to use Audrey Hepburn’s singing voice for much of the role, so she recorded several of the songs transposed to the keys in which she was most comfortable. But even after it was decided that “Ghostess with the Mostest” Marni Nixon would dub almost all of Hepburn’s singing (except for the first and last sections of “Just You Wait” and two lines at the beginning of “I Could Have Danced All Night”), the Hepburn keys were retained. As a result, Nixon’s performance was compromised, and Eliza’s songs come across only moderately well on this recording. But Stanley Holloway, back again as Alfie Doolittle, is delightful as ever; Wilfrid Hyde-White is an ingratiating Pickering; and vocal ghost Bill Shirley ardently sings “On the Street Where You Live” on behalf of actor Jeremy Brett’s Freddy, even if their voices seem quite a poor match when you’re watching the film. The CD is a much-expanded version of the original LP. Extras include a lovely orchestral version of “Wouldn’t It Be Loverly?” for the flower market scene preceding “With a Little Bit of Luck,” the servants’ chorus lead-in to “The Rain in Spain,” intermission and exit music, and best of all, the gorgeous “Embassy Waltz” in a wonderful recording not from the film soundtrack. — M.P. 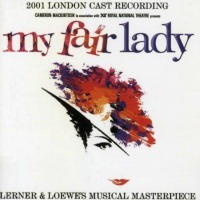 Broadway Cast, 1976 (Columbia/Masterworks Broadway) (4 / 5) The CD edition of this cast album of the 20th anniversary Broadway revival of My Fair Lady was belated but very welcome, as the recording is arguably second only to the original cast album in general excellence. Ian Richardson is a mercurial Higgins, Christine Andreas is superb as Eliza, and George Rose has a rousing time as Alfie P. Doolittle. (He won a Tony Award for his performance.) It’s great to have the wonderfully funny and authentic Robert Coote back as Colonel Pickering, and Jerry Lanning is the most vocally resplendent Freddy on record. When he sings “On the Street Where You Live,” you expect Eliza to throw herself right into his arms. The sound quality of the recording is somewhat dry, but sharp and clear. — M.P. 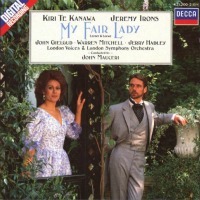 Studio Cast, 1987 (London) (2 / 5) As Eliza Doolittle, the Maori operatic soprano Kiri Te Kanawa affects a convincing Cockney accent, and her voice sounds beautiful in the higher reaches of the score. Still, there’s a studied quality to her performance. The salient point to make in regard to Jeremy Irons’ portrayal of Higgins is that this role should not be played by someone with a notably sibilant “s”; although Irons is assuredly a great actor, he’s miscast as a professor who’s a stickler for perfect pronunciation of English. Sir John Gielgud sounds ancient as Pickering, but the opera tenor Jerry Hadley has just the right voice for “On the Street Where You Live,” and Warren Mitchell is a colorful Alfie Doolittle. The London Symphony Orchestra is ably led by John Mauceri. — M.P. Studio Cast, 1993-94 (JAY, 2CDs) (3 / 5) This note-complete aural document of the score is essential if only for archival purposes. 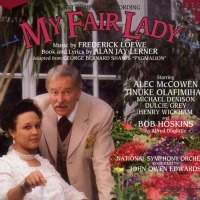 In the case of My Fair Lady, completeness is particularly important for the dance music, largely omitted on other recordings of the score but included here. Other pluses: Alec McCowan is a delightful Higgins, and Tinuke Olafimihan is an excellent Eliza, fully credible in the Cockney numbers and singing “I Could Have Danced All Night” gloriously. As Freddy, Henry Wickham performs “On the Street Where You Live” with sincerity, though his voice is rather shaky. Michael Denison is okay as Pickering, even if he makes little attempt to match pitches in “You Did It.” But Bob Hoskins, a fine actor, simply doesn’t have enough voice for Alfred P. Doolittle’s songs; he sounds raspy and almost inaudible when he tries to sing the low notes. The National Symphony Orchestra plays beautifully under John Owens Edwards, and is recorded in state-of-the-art sound. — M.P. London Cast, 2001 (First Night) No stars; not recommended. As soon as you hear that this cast album begins without the pulse-quickening music that began every previous production and recording of My Fair Lady, you’ll sense that you’re in for a deeply disappointing experience. Aside from fussy rearrangements/re-orchestrations by the normally reliable William David Brohn, the performance suffers from some very weak casting. As Eliza, Martine McCutcheon displays an exceedingly thin voice, and Mark Umbers’ rendition of Freddy’s “On the Street Where You Live” is full of superficial, heavy-handed effects but lacks real emotion. On the credit side, Jonathan Pryce offers an intelligent characterization of Henry Higgins, deftly walking the line between singing and speaking, and his imitation of Zoltan Karpathy’s Hungarian accent in “You Did It” is genuinely funny. As Pickering, Nicholas Le Prevost is also fine, and his byplay with Pryce is delightful. But it’s difficult to enjoy these worthy performances, given the setting. This recording is sadly indicative of the destructive influence that producer Cameron Mackintosh has had on musical theater, both in terms of his productions of highly problematic new shows and his ill-conceived revivals of classics. — M.P.